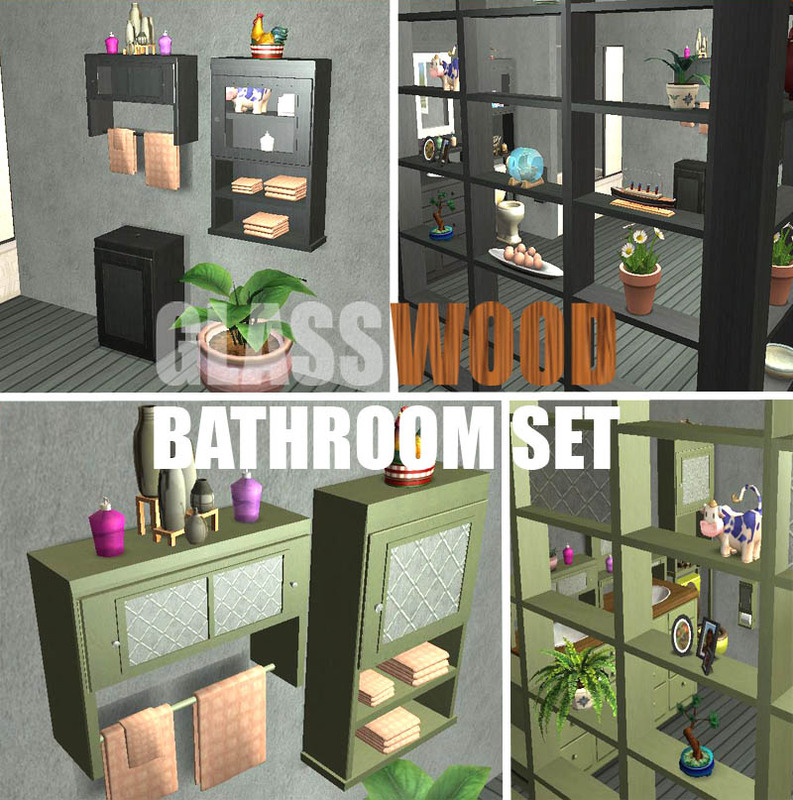 Introducing the GlassWood Bathroom Set- 15 new meshes to beautify your Sims' bathrooms. Don't let the name fool you though- many of these pieces can be used in other rooms. What you get: Bathroom Shelf, Wall Shelf, Short Divider/Shelf, Tall Divider/Shelf, Low Over-The-Sink Shelf, High Over-The-Sink Shelf, Hanging Towel Rack and towels for it, Toilet Paper Holder, 4 columns, a hamper and a mirror. There are also plenty of recolors- 13 in all for each item. 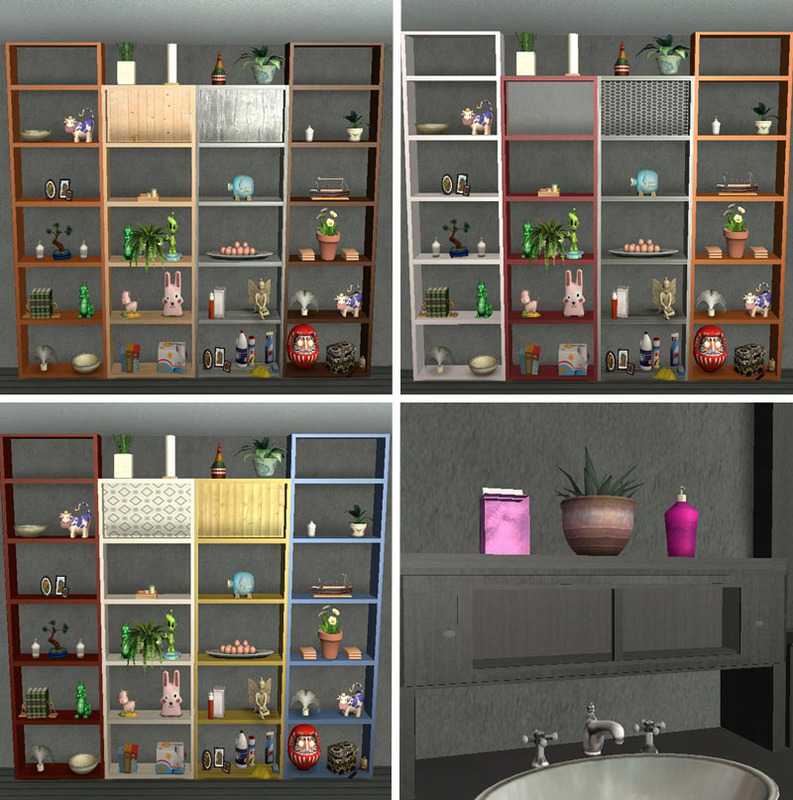 The BATHROOM SHELF is the MASTER and holds all the recolors for everything EXCEPT the hamper, mirror and hanging towels. It is needed in game for all but those 3 meshes to work. The files are clearly named to make it easy to delete any slave meshes you might not want. The hamper and mirror are separate objects with their own recolors due to the glass. The hamper didn't look right with the glass, the mirror didn't look right with transparent glass in the frame. The shelves and the towel rack all have slots! See pics. Use "M" to cycle through them in game. NOTE: For the sink shelves- it's easier to place one on the ground (in the air actually), place deco on the slots THEN place the shelf over a sink. The wall shelf and towel rack are not shiftable. The mirror is if you have Apartment Life. The tall divider/shelf does not have glass in the top shelf- the short one does (no slots on that shelf because of the glass!). Also, the very top shelf of the tall divider/shelf does not have slots. You can use OMSP's to place objects on that shelf. The hanging towels are not slaved to the in-game towels. They're placed on the footprint to match up with the rod on the towel rack. They will shift up and down if you have Apartment Life, but the towel rack DOES not shift. The tall divider and tall columns are all ceiling height. There are 4 columns, 2 tall and 2 short of each kind - 2 are very slim and 2 are pretty much regular columns. All of them are placed in the footprint to match up to the side of the divider/shelves. The slim ones can be used to hide the wall if you put a divider up against a wall because the wall eats it. The regular columns are meant to fill up the empty space left if you want to arranage the divider/shelves in a pattern- like an "L" shape. You will have to use "boolprop snapobjectstogrid false" to place a divider at another angle. (See pics and if you have any questions, feel free to ask. I'm not the greatest at explaining this stuff!) The "setquartertileplacement on" cheat won't work to place another divider properly. 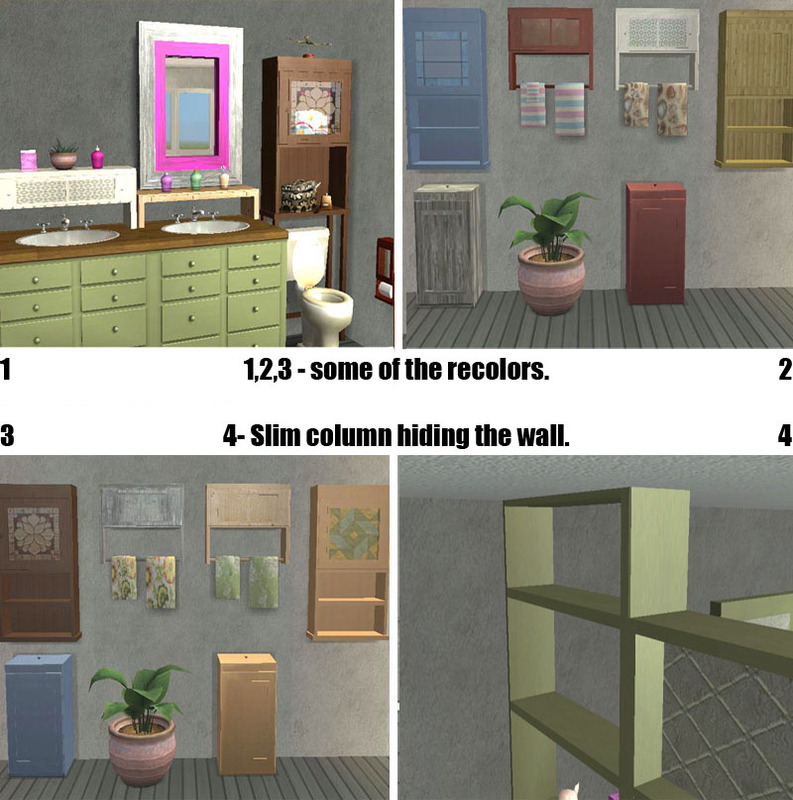 Bathroom Shelf 350, Short Divider 275, Tall Divider 300, Low Sink Shelf 175, High Sink Shelf 200, Towel Rack 225, Wall Shelf 275: Surfaces>Shelves; Mirror 175 Deco>Mirrors; Hanging Towels 100, Toilet Paper Holder 25: Deco>Wall; All 4 Columns 10, Build>Misc; Hamper, 150, Deco>Sculptures. All objects should be base game. Any problems, please let me know. Feel free to recolor- the UV Map for the glass is available to show where the knob is on it. (The knobs take their color from the glass.) If you want it, let me know. Content used in screenshots is by: Plastic Box (plants), Guatla (tub, toilet and some deco), Cameranutz 11 (small fairy), Buggybooz (counter, bowl), Maxis/EAxis and myself. 1936 people have said thanks to mustluvcatz for this download.